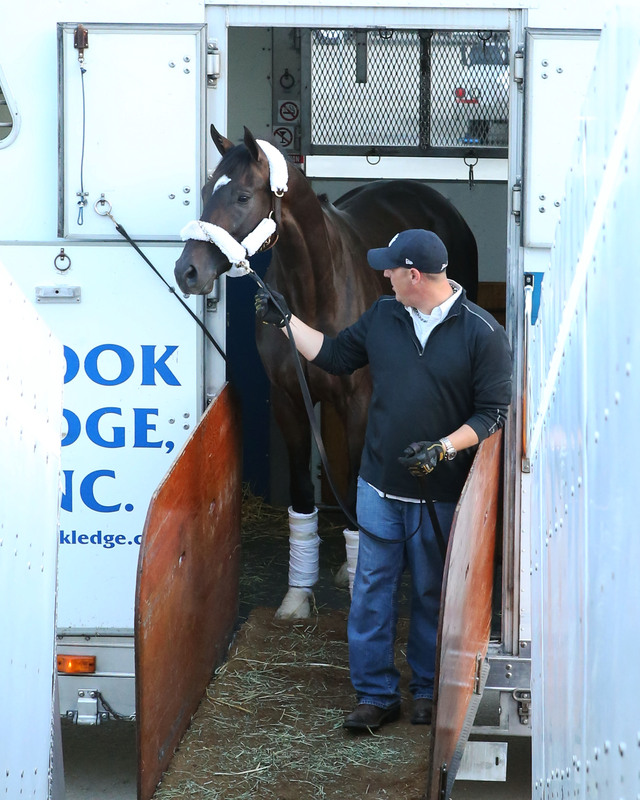 Kentucky Derby winner Always Dreaming leaves for Pimlico and the second jewel of the Triple Crown, the Preakness Stakes (photo by Coady Photography). LOUISVILLE, Ky. (Tuesday, May 9, 2017) – Always Dreaming, hero of last Saturday’s 143rd running of the Kentucky Derby Presented by Yum! Brands (Grade I), departed Churchill Downs at 6:40 a.m. Tuesday morning for the short ride to Louisville International Airport and a flight that would take him to Baltimore and Pimlico Race Course for the May 20 Preakness (GI). Also on the same flight to Baltimore was Royal Mo, an also-eligible for the Derby who did not draw into the field of 20. Three other Derby runners that are considered probable for the Preakness walked Tuesday morning: Lookin At Lee (second), Classic Empire (fourth) and Hence (11th). Gunnevera, who finished seventh, returned to the track to jog twice around alongside a pony. Regular exercise rider Victor O’Farrel was aboard. Owned by Peacock Racing Stables, Gunnevera was added to the Preakness probable list Monday afternoon and will have Mike Smith aboard in Baltimore. The late-running colt is scheduled to van to Baltimore early Saturday morning. Also scheduled to leave Churchill Downs later Tuesday for a return to California were Derby runners Battle of Midway (third), Gormley (ninth), Sonneteer (16th) and Irap (18th). Godolphin’s Thunder Snow (Ire), who did not finish the race after being rank and bucking soon after the start, returned to the track for a second consecutive day and jogged a mile alongside a pony and then cantered a mile under Daragh O’Donohoe. Thunder Snow was scheduled to leave Churchill Downs on Tuesday afternoon for Huntsville, Alabama, where he would catch a flight to England. Note: The preceding was a press release from KyDerby.com.